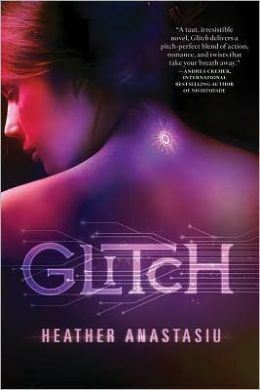 I came across this series after I had read Cinder and someone on Goodreads had asked if it was necessary to read Glitch first. I wondered what the similarities were there and if i was going to come across another series that had a similar theme. Thankfully, aside from a semi cyborg type thing (i.e. some level of computer intelligence or control) – that’s really where the similarities end. In this story, we meet Zoe (Zoel) who is almost 18 i believe and in a society that’s living underground after a nuclear war supposedly destroyed ‘The Surface’. In this under ground community, everyone is implanted with V-chips that control their emotions since that’s believed to have been the downfall of society. The V-chips make is so that everyone follows computerized orders, they only see the world in shades of gray (literally) and they follow very specific routines without feeling. It’s when Zoe’s chip starts to glitch that she begins to see the world in color and feels emotions that she can’t pin down. She’s also having dreams that both scare her and don’t make sense. It’s after a series of events that she begins to notice a boy with blue green eyes staring at her – and this boy is who we come to know as Adrian. He plays quite the pivotal role in Zoe’s life moving forward. As it turns out, he’s from the Surface – part of the Rez (the resistance) and he has visions that he is then on missions to carry out. In many of his visions, he sees Zoe and tries to save her from being discovered and deactivated. Its through her relationship that builds with him that Zoe finds herself on the surface briefly, experiencing what is discovered to be an allergic reaction that almost kills her and forces her to go back to The Community. Upon her return, she learns that her friend Max is a glitcher too, and this is where things begin to get even more complicated. Because Max can feel his own emotions, he begins to feel more passion towards Zoe, and she doesn’t reciprocate in the same way – for various reasons. This brings tension to everyone, and the story’s roller coaster gains speed. From here on, it’s fast and furious – more glitchers, the confusion as to why there are so many in this generation and why they have gone undetected. The question begins forming of who you can trust and who’s playing you. What’s a real emotion for Zoe and what’s a manipulation – and is it possible to Love – and who would she love? So, where this first installment leaves us is on a journey to get out of this post apocolypic society that controls, in the hopes that there’s some way to fight – but the question is, who’s going to help her fight and who’s going to fight her. I think that we’ll get a really great series out of this one – since it seems like the dynamic between characters and the powers that they possess will keep things interesting. I’m always a fan too of stories where it’s sort of a ‘coming of age’ type thing, where our lead is just now beginning to understand the power that she has inside her to be both an individual and a leader and i think that’s where this story is going for Zoe. Enjoy! I’m on to book 2! This entry was posted in Dystopian, fantasy, Reviews, Young Adult and tagged Dystopian, fantasy, Glitch, Heather Anastiu, YA by iscm13. Bookmark the permalink.